Beat the hot weather with this easy summer drink. This strawberry lychee soda is the perfect fizzy non-alcohol drink to quench your thirst on a hot day. If there’s anything I want these days, that is ice cream. Summer is here and mother nature has been signaling hot temperature. It’s still not bad compared to the life in Southern California, but still… I can’t stand anything above 80s. That’s probably my limits. And I’m glad the hubs agrees with me. He is always so very happy when I drag him to an ice cream store, as he loves ice cream more than I do. Anywho, I’m trying to cut down on it since there’s no way to get an ice cream daily. Luckily for me, because KitchenAid has this sodastream machine that works like magic. This machine is magical! I’ve been making lots of fun drinks with this machine. It’s super easy to make, and you’ll feel guilt-free for having this instead of ice cream. I am glad the hubs is on the same page on this one as well. I’m making this extra fun with adding fruit into this drink. This soda drink is fairly easy to make and the ingredients are very straight forward. Strawberry + lychee + strawberry syrup or cane sugar syrup + sparkling beverage. I’m adding a how-to video so you can create one at home, too. Check this out and bring on the bubbles! And wait! It’s time for the huge June group giveaway, and this time it’s all about Phoneography! What’s phoneography? Well it’s photography you take with your phone! Get it? Phone + photography = phoneography. I don’t know who coined the term, but it makes sense and there are even some great Instagram hashtags related to it. While I always recommend investing in a DSLR, I know what it’s like to not be able to afford one, and your photography doesn’t have to suffer just because you can’t afford a huge investment right now. 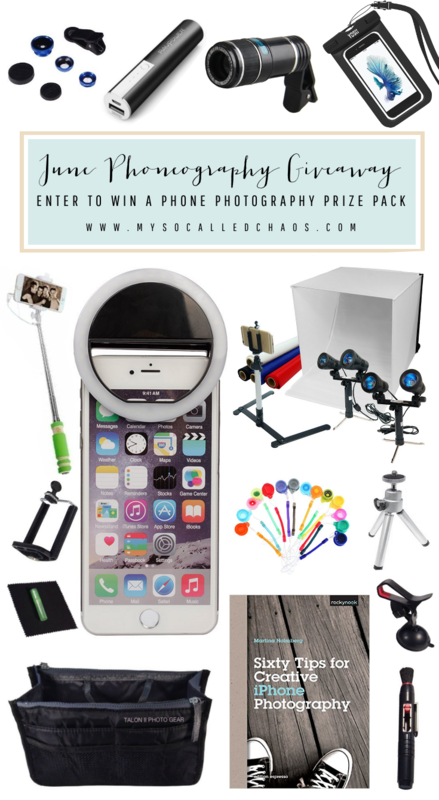 If you are a blogger, shop owner, Instgrammer, or just someone who wants to take better photos with your phone-there are things you can use to improve-and I (along with some other fabulous bloggers and creatives) joined Angie from My So-Called Chaos to bring one lucky winner a big pack of them! This month we’re giving away a big prize pack of goodies* that will help with taking better pictures from your phone. Giveaway is open worldwide** and ends at 12AM MDT on 07/12/16. Entering below agrees to all terms and conditions within the Rafflecopter widget. *Prize inclusions depend on availability, may not be entirely as depicted in the photo (but will be similar). **International Winners will receive a cash prize of $150 due to shipping matters. Disclosure: The recipe above was a sponsored post written by me on behalf of KitchenAid. Thank you for helping support the brands I love. As always, all opinions are 100% my own. Incredible looking drink! I had no idea KitchenAid had that machine! This looks so delicious and refreshing, I need to try it! The perfect summer drink to sip on! Looks so refreshing! Looks perfectly refreshing and delicious! Thank you, David! I hope she’ll like it . I love the soda stream machine. This looks so refreshing! Thank you, Zainab. It’s truly refreshing and you can be creative with your drinks.